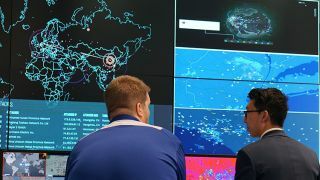 With its emphasis on flexibility and creative processes, an Agile Command & Control Room naturally lends itself to the connection of remote users and on-site users’ BYODs (Bring Your Own Devices) to a standard command and control (C&C) center’s AV infrastructure. A control room featuring Black Box. This said, even the most open-minded of C&C managers will never exchange flexibility for system security. Hence for the Agile Control Room to win acceptance, it must balance these two apparently opposing forces. Here are three ways to achieve that balance. These are the kind of C&C centers that this article is focused on, under the agile control room concept. But just because these control rooms allow flexible access doesn’t mean they have to be insecure. In fact, the very best of them protect their operations by using robust and reliable security systems. But how do these agile control rooms keep their AV infrastructure secure? Well, an up-to-date identity management database is a big part of it. In particular, “you have to be able to verify the identity of every remote user,” said Utelogy VP of Product Development David Goings. “The most important thing is to have a secure core within the operation’s permissions software,” he added, so that all remote users can be authoritatively identified and their appropriate level of access provided every single time. This same advice applies to BYODs brought into the C&C center by on-site users. As long as proper authentication procedures are in place for AV infrastructure access (backed by BYOD users keeping their own devices properly swept for viruses and malware), personal smartphones, tablets, and laptops can help C&C staff do their jobs more effectively and flexibly without threatening the agile control room’s security. The two opposing forces are in balance. We live in a browser-based world. So it makes sense to employ professionally developed browser-based solutions to make operations more flexible in C&C centers—without sacrificing security. According to Christie’s Jon Litt, there are a wealth of secure browser-based solutions being used to manage C&C AV infrastructures today. Examples include dashboard systems to manage utility or production operations; mapping applications used first responders, logistic operations, and traffic management systems; and video management servers that control surveillance cameras across a building, a campus, a region or even globally. “Control access systems, fire alarm systems, building management systems are also browser-based collaboration solutions commonly used for control rooms,” said Litt. The common feature in these browser-based solutions is that they are intuitively easy and safe for workers to use. Yet again, flexibility and security are in balance. Whether you are following an agile control room approach, or sticking to something rigid akin to NASA during the Apollo years, you can count on your C&C’s user base and duties expanding over time. So be sure to choose AV products and management systems that can scale up to meet such growth, such as Christie’s display equipment and Utelogy’s software-based AV management software (now in just-launched version 2). After all, a scalable AV infrastructure is both flexible and secure. It can grow to keep up with a growing user base and portfolio of functions, while staying true to its original security specifications. One last time, the two forces can balance, rather than compete.